Sunday Night believes that bullying – in schools and online – is an important issue. It’s resonated with a lot of parents and children out there, and many of you have already shared your experiences with us. For years, Sarah Newlassie has been the victim of spiteful, malicious bullying in the schoolyard. At Sarah’s school, Pakenham Secondary College in outer Melbourne, play time has become fight time. Incredibly, some students even operate a YouTube channel dedicated to broadcasting the schoolyard attacks. Sarah says the bullying began with name-calling, before it escalated when a pack of girls chose her to pick on and intimidate. In one incident late last year, she says she was cornered by the group. Then in June this year, the bullies launched a premeditated attack on Sarah. Leaving school at the end of the day, a group of kids began filming her. Then one attacked, punching Sarah in the back of the head. Jade Claffey and Mason Gapes are also in Year 8 at Pakenham Secondary. Just two days after Sarah was hit from behind, Jade was also attacked. Again, it was a playground ambush; the kids filming before the assault begins. Jade has not only been the victim of physical attacks at Pakenham Secondary, she’s been humiliated by bullies over her appearance. Worst of all, the cruellest of taunts from the bullies at this school have been about her father Paul, who died two years ago. Brett Murray is one of Australia’s leading experts on bullying in schools and how to stop it. He says this kind of hateful language has become all too common. Jade and Sarah readily admit they are no angels. They’ve even been accused of bullying themselves. Both have been suspended for hitting other students. Sarah says she “accidentally” slapped someone. “I did it and I didn’t mean to and I was suspended.” She says she immediately apologised to the student. The girls’ parents say they’ve been disciplined at home for those incidents. But they want to know how the bullying culture at the school spiralled out of control and they want answers from the school principal, Ray Squires. Mr Squires refused to talk to Sunday Night when we approached him. He later provided a short written statement, saying there is no place for bullying at the school. We have posted the full statement below, along with a response from the Department of Education. The toxic bullying isn’t confined to Pakenham’s school grounds. A wider look at the issue reveals no school is immune, and no age group off limits. On the other side of the Australia, Angela Cox visits Eva Davey. She’s a smart girl with a lot to live for, but she’s also been pushed to the brink by bullying. After arriving in Perth from England with her family, she was first picked on for being the new kid in class. Traumatised by the relentless bullying, Eva began to cut herself. The situation got so bad that Eva was admitted to hospital late last year after a therapist discovered she had a plan to kill herself. Carl and Leigh are upset the girl responsible for most of the bullying hasn’t even been expelled. They want the government to do more – specifically, a three strikes and you’re out policy in every Australian school. Brett Murray says parents also have the power to reduce bullying by controlling what their kids are doing on their mobile phones. 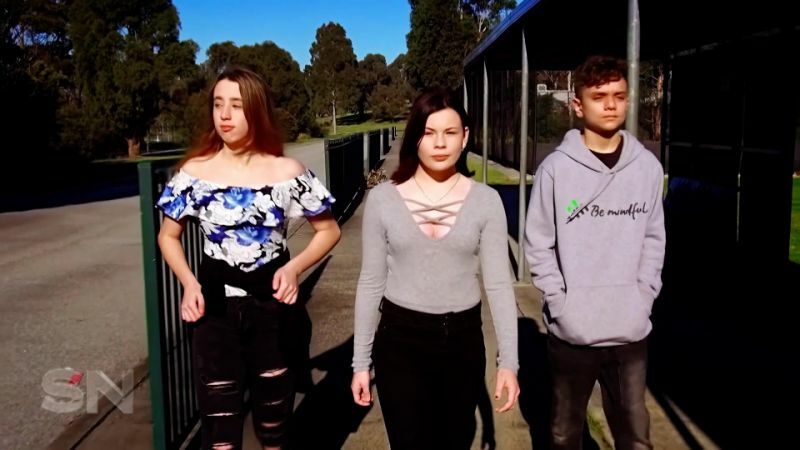 Back in Melbourne, bullying victims Jade, Mason and Sarah have had enough. With the support of their parents, they’ve all left Pakenham Secondary and enrolled elsewhere. Sunday Night believes that bullying – in schools and online – is an important issue. It’s resonated with a lot of parents and children out there, and many of you have already shared your experiences with us. We want to STOP BULLYING NOW. Send a video or photo to our Facebook, Twitter or Instagram holding a sign with the hashtag #StopBullyingNow – and remember, a little kindness goes a long way. If this story has raised any issues for you or someone you know, there is help available. Kids Helpline is a free 24/7 phone and online counselling and support service specifically for children and young people aged 5 to 25 years. In addition to their phone and online counselling work, the Kids Helpline @ School program connects with schools via video streaming to talk with classes about both school based and cyber bullying. Brett Murray is the CEO and co-founder of Make Bullying History. The foundation provides educational seminars to both primary and secondary-aged students, as well as professional development workshops for teachers and seminars for parents, creating a proven holistic school community approach to disarming bullying. Sunday Night sought comment from the Department of Education, as well as Pakenham Secondary College Principal, Ray Squires. Incidents of violence and aggressive behaviour involving students from Victoria’s government school system, which includes more than 1,500 schools and over 600,000 students, remain relatively rare. The safety and wellbeing of our students is our number one priority and there is no place for aggressive and threatening behaviour in our schools. The Department’s policies were followed. Police have investigated this incident and issued cautions to those involved. The school has taken these allegations very seriously and has taken disciplinary measures. Safety plans are in place at the school, and students are being supported through this difficult time. Principals work hard to ensure all students are safe at school and remain engaged in education, and ensure that all interventions and disciplinary measures are utilised. There is no place for incidents like this at our school. It does not reflect the behaviour of the overwhelming majority of our students. The school takes these matters very seriously and has introduced a range of measures to prevent and respond to bullying and aggression.